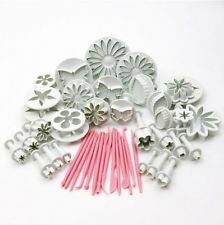 Cake Toppers - These styles range from traditional all the way to modern. Come on in and see whats new. Cake Stands - Available for both rent or purchase, our cake stands and pans will help you create your own gorgeous baked design. Buttercream Icing - Your cake might as well be naked if it's not topped with our delicious buttercream icing! We make it fresh when you place your order, so call us today! Pan Rental- We have a vast collection of pans you can rent and bake your own creations. Supplies- We carry all sizes of cake boards and boxes, food color, tips, sprinkles, and all your other cake and candy supplies.